Our festive special mehndi designs displays trendy & smart & latest mehandi designs. These designs can well be applied on occasions like engagement, wedding, festivals, parties and on every traditional event. Designs are simple but at the same time gives a sober and sophisticated look. 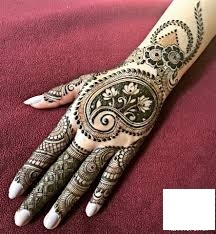 One can have variety of designs for back hands, feet, palm and match for both hands.If the best henna paste is used then definitely these designs are going to give a glorious look to your hands. Designs can well be matched with the jewelry one is wearing. If the jewelry worn is just a bracelet then one can go for single and curved paisley designs and if collection of bangles are worn then surly one can go for much intricate and thick designs. Choose the more and best designs from our Diwali special page. Also visit bridal mehndi designs, rajasthani mehndi designs. Do not miss out our new attractions “new mehndi styles” which have mughal mehndi designs and zardosi mehndi designs. For more variations download designs from “shaded mehndi designs” & “glitter mehndi designs” collections.